This paper reports a very unusual site of ossifying fibromyxoid tumor (OFMT) and review the medical literature. In the maxillofacial region, OFMT has been rarely reported. However, malignant OFMT was recently traced in the tongue. Clinicians and maxillofacial pathologists should pay a rapt attention to such an innocent looking lesion that can be easily confused with the ossifying fibrous epulis. This holds true when OFMT is encountered in the gnathions. 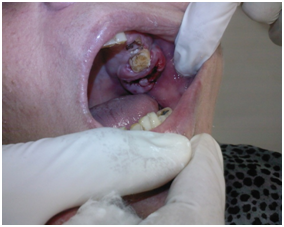 A 72-year-old female, non-smoker and non-alcoholic, manifested a swelling in the posterior maxilla which embraced the posterior molars buccopalatally. The lesion had a chronic course with occasional hemorrhage on touch and mastication. Although the overlying mucosa was slightly reddish and firm, the lesion was totally asymptomatic (Figure 1). Antibiotics, NSAID, anti-fungal medications and topical gels rendered no therapeutic effect. No odontogenic irritants could be blamed. History of any concomitant tumors was negative. There were no running diseases in the family except for NIDDM. An incisional biopsy was cut for microscopic examination. Radiographically, the periapical radiograph exhibited normal maxillary trabeculae and some bony saucerization. The differential diagnosis included pyogenic granuloma, ossifying fibroma and ossifying fibromyxoid tumor. Figure 1 Clinical picture of the OFMT embracing the posterior molars. Histologically, the overlying epithelium displayed signs of pseudoepitheliomatous hyperplasia. The connective tissue revealed an impressive myxomatous background, in which lobules of myxoid areas were conspicuous (Figure 2). 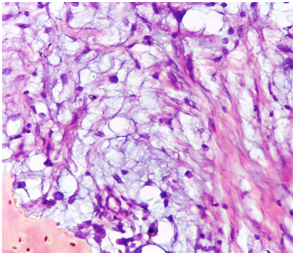 Evident in the histological field was the occasional peripheral bone formation, which embraced the myxomatous stroma (Figure 3). The focally rich fibrocellualrity of the lesion should neither mitotic figures nor cellular atypia. Neither granuloma formation nor malignant features could be appreciated (Figure 4). The diagnosis was, accordingly, an ossifying fibromyxoid tumor. Regarding confirming the diagnosis of OFMT, no immunohistochemical markers were indicated because no specific markers are adjunctively recruited in the medical literature. A follow-up interval was determined: every 6 months. The patient was educated about the necessity of compliance. Figure 2 Photomicrograph showing signs of pseudoepitheliomatous hyperplastic epithelium, overlying an impressive myxomatous background. (H&E stained, Original magnification: 4x). Figure 3 Photomicrograph characterizing occasional peripheral bone formation, which embraced the myxomatous stroma. (H&E stained, Original magnification: 40x). Figure 4 Photomicrograph showing a focally rich fibrocellualrity of the lesion with neither mitotic Figure nor cellular atypia. (H&E stained, Original magnification: 40x). Folpe et al.9 reviewed 56cases of OFMT and concluded that they should be considered tumors of intermediate malignancy. Their line of differentiation remains unclear, although the authors considered it a translocation-associated sarcoma. In this reported case, there is no evidence of recurrence hitherto. The lesion underwent a very benign discourse. Makhson A, Bulycheva I, Kuz'min I, et al. Ossifying fibromyxoid tumor. Arkh Pathol. 2006;68(2):41–44. Williams S, Ellis G, Meis J, et al. Ossifying fibromyxoid tumour (of soft parts) of the head and neck: a clinicopathological and immunohistochemical study of nine cases. J Laryngol Otol. 1993;107(1):75–80. Ottoman B, Helmy I, Amin A, et al. Prognostic validity of AgNOR in a Diaspora of maxillofacial fibro-osseous lesions. W J Pathol. 2015;4(5):25–33. Min K, Seo I, Pitha J. Ossifying Fibromyxoid Tumor: Modified myoepithelial cell tumor? 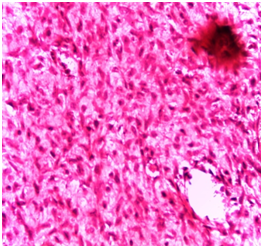 report of three cases with immunohistochemical and electron microscopic studies. Ultrastruct Pathol. 2005;29(6):535–548. Nonaka C, Pacheco D, Nunes R, et al. Ossifying fibromyxoid tumor in the mandibular gingiva: case report and review of the literature. J Periodontol. 2009;80(4):687–692. Ren D, Tang Y, Geng N, et al. Ossifying fibromyxoid tumor in the mandible: a case report. Hua Xi Kou Qiang Yi Xue Za Zhi. 2014;32(2):200–202. Ohta K, Taki M, Ogawa I, et al. Malignant ossifying fibromyxoid tumor of the tongue: case report and review of the literature. Head Face Med. 2013;9(16):1–6. 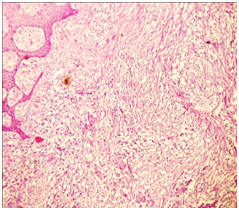 Enzinger F, Weiss S, Liang C. Ossifying fibromyxoid tumor of soft parts: a clinicopathological analysis of 59 cases. Am J Surg Pathol. 1989;13(10):817–827. Folpe A, Weiss W. Ossifying Fibromyxoid Tumor of Soft Parts: A clinico-pathologic study of 70 cases with emphasis on atypical and malignant variants. Am J Surg Pathol. 2003;27(4):421–431. ©2015 Ottoman. This is an open access article distributed under the terms of the Creative Commons Attribution License , which permits unrestricted use, distribution, and build upon your work non-commercially.